Tivoli Audio unveils new Custom Cabinets for Albergo+ digital radio | What Hi-Fi? 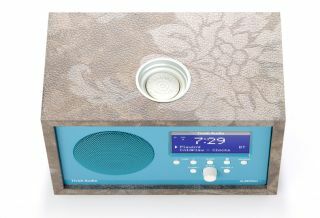 Tivoli Audio has announced the launch of its new Custom Cabinet programme – a collection of 16 different cabinet designs that will let you personalise your Albergo+ Bluetooth digital radio to suit your own tastes. The newly-launched Tivoli Audio Custom Cabinet Albergo+ collection is made up of three natural wood finishes and a further 13 patterned finishes, which include the likes of Granite Rose, Visone Leather and more. All of the Custom Cabinets are hand built by the manufacturer in Italy and can be changed should you decide that you no longer like your original choice(s). All you do is slide the radio into your newly-chosen cabinet. And while the initial collection of Custom Cabinets stretches to 16 options, Tivoli has said it will be looking to extend the line on a periodical basis and may even consider one-off requests from individual consumers, as well as businesses. The Tivoli Audio Albergo+ Custom Cabinets are now available to purchase direct from the audio company, with prices starting at £49 for the three natural wood finishes and £99 for the remaining options.